David Karpin discusses his relationship with NeuRA research from contrasting perspectives as a volunteer and a NeuRA Foundation board member. Five years ago, as I was sitting watching the morning news, I fell off my chair to the floor. Within the hour I was in hospital, having suffered a severe stroke. Afterwards, I could not walk, speak clearly, or use my left arm or hand. I was totally reliant on other people. My neurologist advised my son I was unlikely to ever walk again. 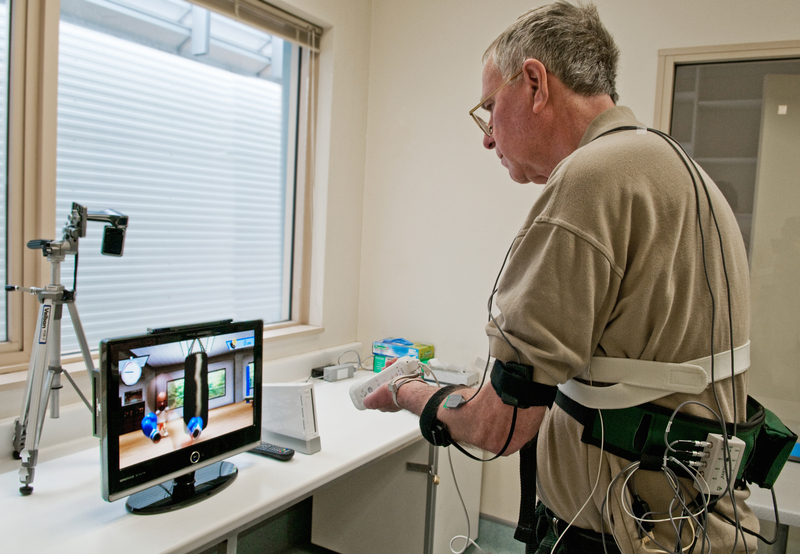 David practices rehabilitation exercises using the Wii. Today, I live independently and can speak clearly, walk unassisted and have partial use of my left arm, hand and fingers. My remarkable transformation is thanks to medical research and in particular to my participation in a stroke rehabilitation study at NeuRA. Using the Nintendo Wii as a rehabilitation tool, this groundbreaking research is translating into results for stroke patients right now, some of whom I introduced to the Wii trial after my own positive experience. I am now heavily involved in NeuRA activities as a volunteer, donor and NeuRA Foundation board member. The Foundation seeks philanthropic support from different groups and individuals with differing preparedness to give, and I assist with this by sharing my extensive experience in executive administration and management. The overall aim is to enhance the benefits for both the individuals and groups who fund research and also for those who stand to gain meaningful benefit to their lives from research outcomes. In addition to management experience, good science communication is important in seeking research funding. In addition, it is important to highlight the economic disadvantage of neurological illness to society due to healthcare burden and reduced workforce participation. Many philanthropic partners prefer to support research that translates interventions into clinical practice, and I am glad to say that translational research is an area of strength for NeuRA. NeuRA has a strong base of ongoing research across a whole array of neurological illnesses. With sufficient funding, we hope it will be possible in future to take on additional areas that have historically been under-resourced but are very important. I remain involved as a volunteer for a trial being run by a PhD student in the McNulty lab. It is my fervent wish that NeuRA’s research continues to be funded, as it delivers real and very tangible results to the community. Hopefully, you will be inspired to also lend your support. Much more needs to be done to achieve NeuRA’s vision of a society free from diseases and disorders of the brain and nervous system. I hope you and many others will share this vision.